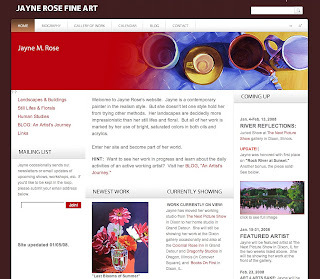 I have finally published my newly redesigned art website. The hardest part was changing the server information from old to new. SiteKreator is the company I went with. It allows me to have a more up-to-date look and also allows me to do all edits and updates through my brower -- no downloading software. Now I can update on any computer -- anywhere. Cool. Previously, I was using Yahoo SiteBuilder, which was fine to start with, but only allowed me to edit only on my PC (that had the software on it). I now use a MacBook Pro laptop almost all the time and SiteBuilder didn't work on a Mac. There are still some things I'm learning and small kinks to work out, but all in all, I really like it. When you have a couple of minutes, take a look!